Back in the Old Testament when there was a tabernacle or temple standing, it included a room called “the most holy place” or “the holy of holies.” This was where the ark of the covenant was and a heavy veil separated it from the rest of the inner temple. It wasn’t a place that people, even the priests, could just walk into. The only time someone could enter this most holy place was on the Day of Atonement, or Yom Kippur. Even then only the high priest could go in and only if he followed the proper rules for entering a place God had sanctified. But why bring this up now? We don’t have a temple or a priesthood or sacrifices anymore. And many Christians will say all that Old Testament stuff belong in the past. Or does it? There actually is a temple today, for “you are a temple of God” (1 Cor. 3:16, WEB). There’s a priesthood, too, because Jesus Christ is the High Priest and He has “an unchangeable priesthood” (Heb. 7:24, KJV). We’re even included in that because we’re meant “to be a holy priesthood, to offer up spiritual sacrifices” (1 Pet. 2:5, WEB). 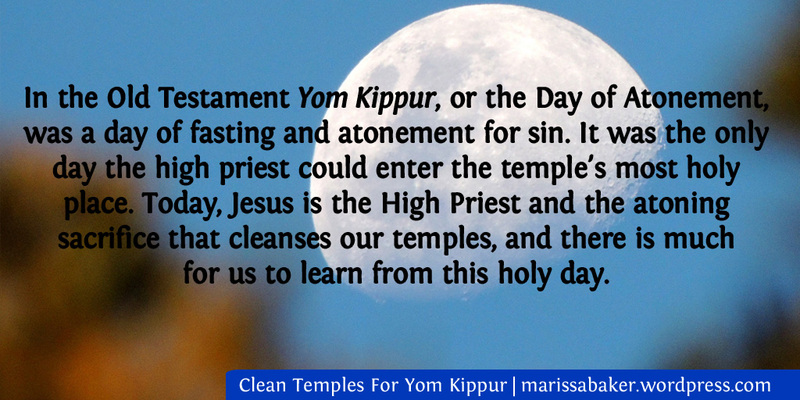 So given these facts, what can we learn from Yom Kippur today? When I was re-reading Leviticus 16, I was surprised to notice that the high priest was told to “make atonement for the Holy Place, because of the uncleanness of the children of Israel, and because of their transgressions, even all their sins” (Lev. 16:16, 33 WEB). I knew he was to make atonement for himself and “all the assembly of Israel,” but hadn’t noticed the holy place needed atoned for as well (Lev. 16:17, 30). There was something about being in the midst of an unclean, sinful people that defiled even the part of the temple where God’s presence appeared. Today, the church body is described as a temple of God (there’s also a temple talked about in heaven, which we’ll get to later). The Greek word used in those passages is always naos (G3485), which refers to the inner sanctuary rather than the entire temple complex (which would be hieron, G2411). We are now God’s most holy place. And like the other holy of holies, we can become defiled by choice (see 1 Cor. 3:16-17) or by the sinful world around us. This is often quoted in regards to marriage, but it’s not limited to that. As God’s people, we’re meant to be careful who we fellowship with. Not that we’re meant to cut ourselves off from the world or the people in it, but that we’re to avoid its defiling influences as much as possible. Unlike the temple of old, we don’t have to wait to receive cleansing nor are we purified by animal sacrifices. Our High Priest can come into His most holy place whenever He wants. Not only that, but we can come on an individual level to our High Priest and ask to be cleansed. There’s no more veil separating us from God. When Jesus died, the veil of the physical temple tore in half (Matt. 27:51; Mark 15:38; Luke 23:45). God’s not separating Himself any more. We can be washed completely clean in the blood of Jesus and made worthy of coming into His very presence. “Christ Jesus came into this world to save sinners” and He did that with one sacrifice “when he offered up himself” (1 Tim. 1:5; Heb. 7:27, KJV). Now with Him as our High Priest, we can “come boldly unto the throne of grace, that we may obtain mercy, and find grace to help in time of need” (Heb. 4:16, KJV). That offer of cleansing and atonement is open all the time to all who turn to the Lord with repentant hearts and ask for forgiveness. So why do some of us still keep the Day of Atonement? I think (hope) it would be enough for me that it’s a command to God’s followers that He described as “a statute forever throughout your generations” (Lev. 23:31, WEB). God’s holy days don’t have an expiration date — He meant for us to keep observing them. 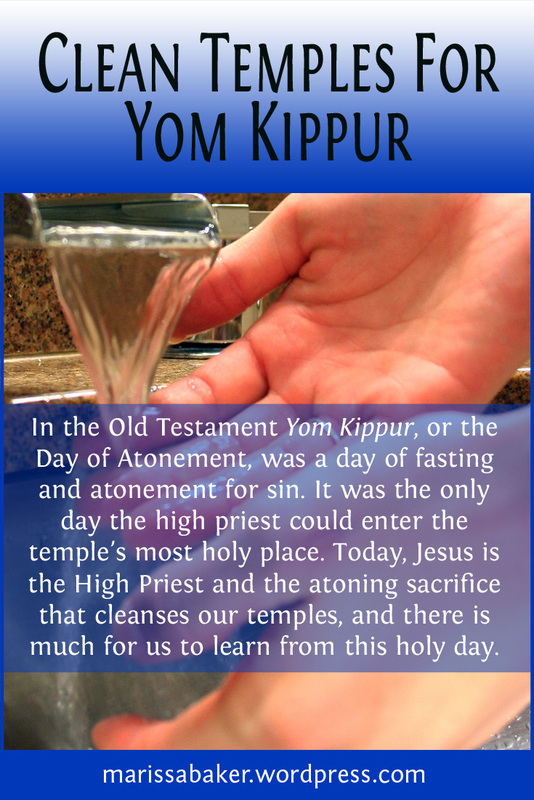 But what’s particularly relevant to today’s blog post is that Yom Kippur serves as a yearly reminder of how much we need Jesus’ atoning sacrifice to make us at-one with God. We are not yet fully perfected. Even as parts of God’s temple, we aren’t immune to the corrupting influences of the world around us. And we need reminders to keep coming back to God and of our need for Him. Fasting for a full day (sunset to sunset) not only fills the command to “afflict your souls.” It also reminds us how helpless we are without God’s provision even just on a physical level. Similarly, we must rely on Him for everything on a spiritual level as well. I hope you all have a blessed Day of Atonement.